The Academy on Thursday announced the nominees for this year's awards, hosted by black comedian Chris Rock. No sooner than the nominations had been announced, than the glaring absence of black actors or directors set social media abuzz under the hashtag #OscarsSoWhite. In a video on Facebook, Jada Pinkett Smith, the wife of actor-singer Will Smith, said: "Begging for acknowledgement or even asking diminishes dignity and diminishes power, and we are a dignified people and powerful." "Hey Chris," she added, in apparent reference to the host. "I won't be at the Academy Awards and I won't be watching. But I can't think of a better man to do the job at hand this year than you, my friend. Good luck." We must stand in our power (Click to watch her facebook video statement). On Saturday, Jada tweeted, "At the Oscars...people of color are always welcomed to give out awards...even entertain. But we are rarely recognized for our artistic accomplishments. Should people of color refrain from participating all together?" Jada Pinkett got the ball rolling and Spike Lee joined the call for boycott. 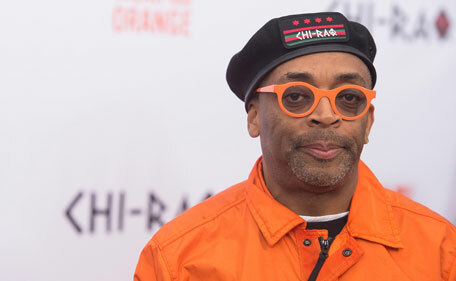 Despite receiving an honorary Oscar at last year's Governor's Awards, Spike Lee posted on Instagram on Martin Luther King's birthday Monday, saying he and his wife would not be attending the Oscar ceremony. Lee's statement said, "We Cannot Support It And Mean No Disrespect To My Friends, Host Chris Rock and Producer Reggie Hudlin, President Isaacs And The Academy. But, How Is It Possible For The 2nd Consecutive Year All 20 Contenders Under The Actor Category Are White? And Let's Not Even Get Into The Other Branches. 40 White Actors In 2 Years And No Flava At All. We Can't Act?! WTF!!" It continues, "Dr. King Said "There Comes A Time When One Must Take A Position That Is Neither Safe, Nor Politic, Nor Popular But He Must Take It Because Conscience Tells Him It's Right." He then lays out what he sees as the reason for the problem: "As I See It, The Academy Awards Is Not Where The 'Real' Battle Is. It's In The Executive Office Of The Hollywood Studios And TV And Cable Networks. This Is Where The Gate Keepers Decide What Gets Made And What Gets Jettisoned To 'Turnaround' Or Scrap Heap. People, The Truth Is We Ain't In Those Rooms And Until Minorities Are, The Oscar Nominees Will Remain Lilly White." At November's Governor's Awards, he told Hollywood, 'You better get smart' about making films that represent the population. His latest film 'Chi-Raq' has not figured in the awards season conversation. With a black Academy president, Oscar host and Oscar producer in Cheryl Boone Isaacs, Chris Rock and Reginald Hudlin, the Academy of Motion Picture Arts and Sciences seems to be pushing for greater diversity. But as Lee points out, the organization itself does not determine which films get made. Gil Robertson, president of the African-American Film Critics Association, responded to their calls for a boycott on Sunday with the following statement: "I think it would be a mistake to boycott anything. The black community needs to understand that receiving an Oscar nomination is a big deal for anyone, regardless of race. Under Cheryl Boone Isaac's leadership, the Academy is moving closer to getting in step with the real world. Change takes time."